This is the last weekend of the Indie Teepee event and I hope you’ve been able to get there and enjoy all the sights and sounds as well as shopping that the event has to offer. This is my last post covering the event and I hope that you agree with me that it is going out with a bang. The item I chose to feature here is a fun one, and considering I don’t do decor (or landscaping) items very much I thought it might be one of those times where I snuck one in. While I didn’t create everything you see in the background, that would go to the wonderful sim known as Netherwood. I just provided a little extra touch to complete my idea/theme. Most of my overall look remains the same from the last few posts but I am featuring a new skin by Modulus which you will be able to find at the Mesh Body Addicts Fair that just recently started. 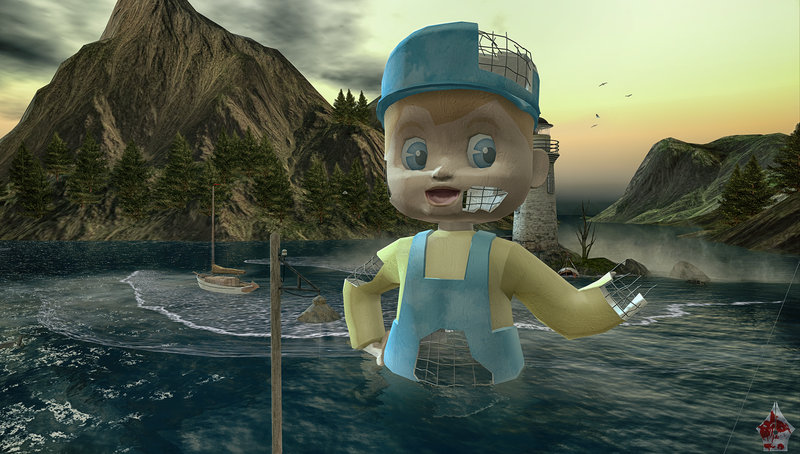 The next photo you are about to see is an overview shot of the BROKEN BOY giant doll by NOMAD. I submerged it in water as if it was a part of an old civilization from long ago that has simply been left dormant and decaying around what has come after it. I really liked this shot too much to edit it into the secondary features shot so I left it as was originally shot. I‘d like to thank everyone from the event coordinator down to all the artists, speakers, musicians, and item creators that took part in Indie Teepee. This is truly one of the most unique events out there and I am seriously proud to have been associated with it as a blogger; I look forward to next years event. Here’s the full credits for those of you who are eagerly awaiting to know what took part in this photo shoot. Make sure when you hit these stores and events you grab demos and happy shopping! I’ll see you again soon but until then, stay stylish fellas! This handsome devil is just the latest from my sponsor in Modulus. Giles comes in six tones (I am featuring Cream here). Also included is a eyebrow shaper and a body shape (which I did not use for this shoot). This is part of a new era of skins by the brand and if this is any indication, good things are in store for the M-Bare division of Modulus. This item was a holdout from the July round of The Men’s Department that I was able to find a look to compliment it with. Even though the weather for me in the real world is a bit warm yet, it’s not something I have to worry about in-world. I like how it is paired with the shirt perfectly and has a good flow to it without looking constricted. Sizes available in the package are for Adam, Belleza, Signature, and SLink and also include a HUD to color change the t-shirt if you choose to go with another color. It’s a back to back entry with another new item from one of my sponsors in RIOT. I have the privilege of reviewing these slightly rolled up shorts which have worn elements and threading that is also worn and frayed. In this FATPACK there are a ton of different options for denim and at least a dozen different choices for the threading. You can purchase single denim colors but if you like variety it is very practical to go with the FATPACK. Sizes you can find in the package include Adam, Belleza, Signature, and SLink. NOMAD never disappoints me when they release an item that catches my eye, which is why I chose this item as part of my blogger product reviews for Indie Teepee. I really get the feel that this large doll was inspired somehow by the Fallout games and also reminds me of something personally. Many may be way too young to remember Big Boy restauarants or have ever had them in their area. It was pretty big in the midwest and outside them was a huge doll in a similar style holding a hamburger. At first I tried to find a post apocalyptic location to shoot at but I could not find any that I was able to put this item down at but I do feel that it turned out nicely as it ended up. This pose set is one I had stored away from a while back from an event and when I was looking for something I thought would fit, I found it in my unused poses but I am glad that I was able to because I do enjoy Le Poppycock and their poses. Check them out if you are needing poses because there is just about something for everyone.